Submitted by Evelyn Kiefer on Sun, 04/29/2007 - 23:21. There is no shortage of nature where I live in Ohio City. Digging into my community garden plot today (a beautiful Sunday afternoon) I found these two slugs. I was impressed by their beautiful markings that look like a leopard's coat. The slugs I knew growing up in the western suburbs were smaller and a solid greenish-yellow color. 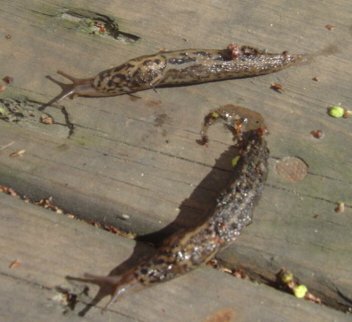 I have only seen these leopard slugs in Ohio City and the Detroit-Shoreway area. I have noticed them occasionally over the past few years. If only they had shells, then you might describe them as cute. Slugs are no friend to gardeners and I am sure these robust specimens could do a lot of damage, so I removed them from the garden and released them a few blocks away to an uncultivated area where they can devour all the plants they want. I am an organic gardener, so slug bait is out of the question. I know about using containers with beer as a traps, but that always seemed like a waste of beer. Submitted by Sudhir Kade on Wed, 05/02/2007 - 15:26. I certainly share this pervading and perservering passion for Organic gardening, and community gardens of course. Yesterday's meeting with City Fresh pioneer Maurice Small was refreshing and enlightening. As Technology Chair for Bioneers Cleveland, I hope to instill and intimately intimate inspiration in all my fellow committee members - from good friend Zebra Mussel, to the venerable matron of all things natural and spiritual Nancy King Smith, and all great sustainable minds in between - Greg Peckham, of Cleveland Public Art, Sister Joanne Buckman of Crown Point Ecology Center, and Molly Schnoke, with whom I am partnering on an ultra-innovative project for E-Philanthropy we are tentatively calling ChooseNEO. Kathy Hexter joins our committee as lead coordinator and CSU Levin School Friday Forum leader. And of course we can't forget those I first worked connected with years ago just prior to spearheading Net Impact Cleveland's initiation years ago - Tori Mills and Linda Robson. I have just recently gotten to know Leslie Kozmon and she brings years of Bioneers prowess and a deep cognitive and collegial understanding of the concept of Biomimicry pioneered by thought leader Janine Benyus. Finally , City Fresh folks Hannah Baldwin and Maurice Small serve to solidify and round out a team of superstar Bioneers. Check out our evolving presence at www.bioneers.org - we will have a wonderful conference this Fall - historic, I say! Lest I digress, back to the point - you speak of essential components to the essence of bioneering and lesson-learning from Mother Earth (Nature). Kudos again, Evelyn! Back to work - service salvation - Peace!